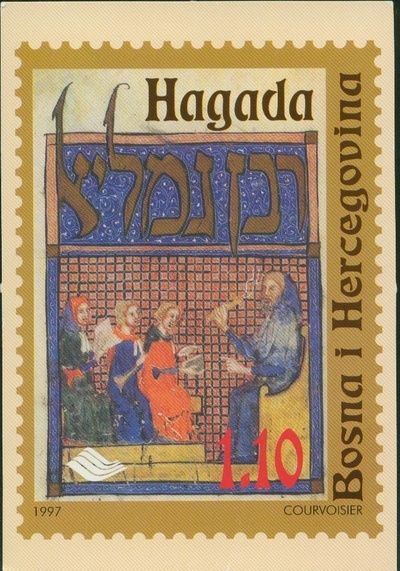 Postage stamp issued by the Republic of Bosnia-Hercegovina honoring the Sarajevo Haggadah. Proving that "Jews" and their putative "intelligence" are nothing but smoke and mirrors is no easy task, especially when we sample—as Gilman permits us to do—19th century thinkers pondering the Jews and their nature. People writing in what were then the new social sciences had a kind of obsession about the Jews. Gilman is right that there is something ominous about this obsession. Even some of the positive statements—to say nothing of the self-flagellatingly negative ones by Jewish figures such as Ludwig Wittgenstein—tend to shade off into objectifications of the Jewish people that a Nazi could find useful. The reader does not come away thinking that Jews do not exist, or that even if they do they are not that bright. Gilman fails to defeat such notions as that Jews value educational attainment because their tradition of poring over holy books inculcated a disposition toward study, or that—in a more speculative vein—the respect accorded to rabbis in the Jewish past made them highly marriageable, which favored procreation by men of learning to the point of raising the average intelligence of the Jews. There are pitfalls when social science mucks around in group differences—Gilman's attack on The Bell Curve (1994), angry and scattershot as it is, does reveal Murray and Herrnstein's source on Ashkenazic excellence, Miles Storfer, to be silly. Certainly governments should seek whenever possible to abstract from group differences. But again, that does not mean that groups are not distinct (or that novelists should have to pretend they are not). 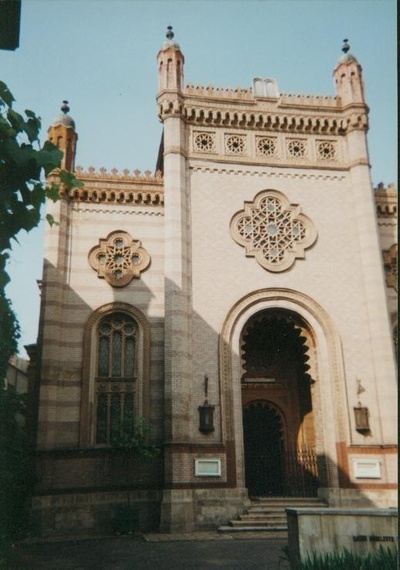 The 19th c. CE Choral Synagogue, Bucharest, 1994 -- Photograph by Stephen Schwartz. "His book became an immediate bestseller and established him as a serious contributor to the discourse about the relationship between race and gender at the beginning of the century. This work of intensive self-hatred had an unprecedented influence on the scientific discourse about Jews and women at the turn of the century. Why? Although Weininger's suicide shortly after publication of the book helped to publicize his ideas, they were hardly new to his contemporaries. The appeal of Weininger's work was not innovation but summation. To the beginning of a century he held up a polemical mirror that many found to contain truths of their times." Beginnings and middles and ends of centuries loom so large for the author that they overshadow individuals and their ideas. "The fin-de-siècle Jewish reading of coughing and urination" (p. 167) goes whizzing past in all of its strange specificity, as does "the fin-de-siècle reading of Heine," (p. 132) among countless other disembodied emanations from Time Period. What these emanations amount to for an observer such as Gilman is difficult to say, given that "in the mythmaking of the time" (p. 170) is another characteristic formulation of his. Once we accept that perceptions are wholly Time Period-determined, their ability to capture reality becomes questionable and so does reality. (Make that "reality.") If life is but a dream, then the dream interpreter—the historiographer—has a lot of, shall we say, intellectual leeway. The reader struggles to keep up with Gilman as he disports himself in the "scientific discourse about Jews and women" mentioned above. Creativity, fantasy, Jellinek, "damaged fantasy," "feminized Jew"—these are like so many lily pads in a pond, used to spring from one formulation to the next. 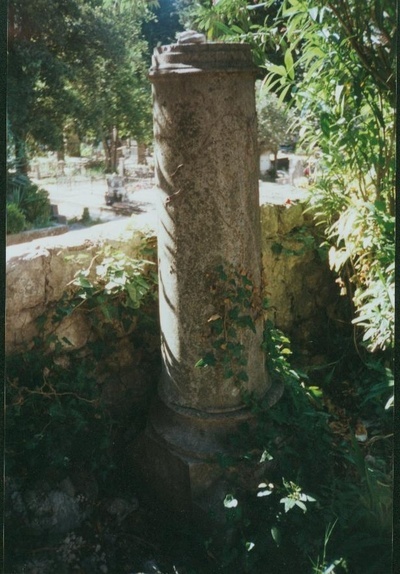 Jewish gravemarker, Kotor. Montenegro, 2001 -- Photograph by Stephen Schwartz. Turning from his summaries of his chosen facts to the facts themselves, when there is something interestingly off-kilter about these, the author is uninterested in explaining. We are supposed to be steeping ourselves in "the argument between Freud and Weininger over 'Jewishness'" (p. 123); but when Freud is quoted as saying in 1926, and in a positive vein, that for him Jewishness has to do with "the safe privacy of a common mental construction," (p. 120) and Weininger is quoted a few pages later as saying (in 1903) that "Jewishness is a 'common mental construction,'" (p. 124) Gilman is mum about the self-hater and his opponent sharing the same definition of Jewishness. If Freud was pilfering it could be rude to point this out. We are left to mull over this incongruous congruity all by ourselves. After surveying the writings of ethnographers and psychologists at the turn-of-the-you-know-what, and mixing in discussions of The Bell Curve and other more recent efforts, Gilman turns to cultural criticism. There is a chapter on Alban Berg's opera Wozzeck (1931) and the Georg Büchner play on which it was based, followed by a final chapter on popular culture in the United States. It is a bit jarring to have gone from Sigmund and Otto in Vienna to Bill and Ted's Excellent Adventure (1989) and the television show Chicago Hope. Time has rolled on, though, and so we must take our cultural artifacts where we find them. "By the 1990s Jewishness and Judaism, Jewish identity and the different body of the 'smart Jew,' come to be interchangeable," (p. 188) writes Gilman, not very meaningfully. A remark by a Gentile character in the show Northern Exposure, he adds, "is an echo of the view that permeates American popular culture in the 1990s: Jews are smarter than everyone else because they are Jews!" (p. 188)—as if this permeating view were going to differentiate for us the Decade we are in now from the Decades we already read about. Gilman's movie criticism is as unsatisfactory as his television criticism. An analysis of Steven Spielberg's 1993 film Schindler's List, for example, becomes so convoluted that its sentences begin to conflate the Spielberg movie with the 1982 Thomas Keneally novel upon which it was based. As an opportunity to look into modern social science's rather disreputable origins, this book has some usefulness. While many of the sources in it are interesting, they are suspended in a thick historicist amber that obscures their meaning and diminishes their importance, neither of which, presumably, was the author's intention.